Have you ever flipped on the T.V.- only to find the masked face of the Batman staring at you as he bravely conquers the bad guy? Or picked up a comic book with the powerful Superman soaring into the sky? If you have, have you ever given much thought as to how these heroes impact the people of our world? According to CNN, “A fascination with superheroes can benefit a child in many ways, including boosting his self-confidence and making him feel powerful.” But why does this feeling of confidence and power have to stop with children? In our day and age, we live though tough times- whether it be a public problem, or a problem that delves down to the personal level. Everyone faces these problems- they are a way of life, however, when facing these problems people often feel as though they are alone in the world and that no one can help them. This is where Superheros come in. Even the greatest heroes, like us, face problems- and like us, they must persevere through them. Through their struggles, we can become aware of ways to solve our own, and gain the perseverance we need to finally overcome them. So, you can imagine why even something as simple as a comic book, can be thoroughly beneficial to people of all ages- not just children. Besides the fact that they face problems, like us, superheroes are ultimately loved and worshiped for one reason: they are images of the better people we strive to be. 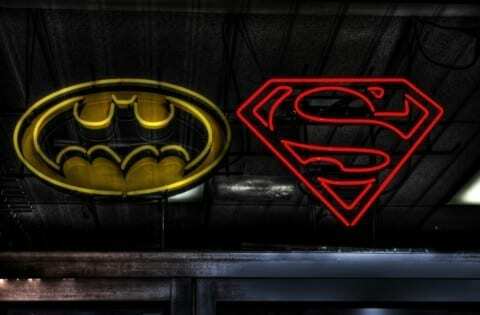 Whether it be Superman’s strength, Batman’s brains, or even Robin’s agility, we all feel inspired and motivated by them to become a better version of ourselves. Using them as role models, we can work hard to improve ourselves as human beings. The motivation and inspiration provided by the superheroes brings out a type of confidence and initiative in us and give us a reason to become better people, and to help our world. So, if you are ever feeling stress, disappointment, or sadness, maybe (just maybe) consider watching an episode of Batman- or even reading a few pages of the nearest Superman comic book- because you never know- even something as simple as a hero can have a huge impact on your life- and change it for the better. And- always remember, when you find yourself facing a tough situation think ‘WWTHD?’ (What Would The Heroes Do?). Heroes In Our Lives by Junia is licensed under a Creative Commons Attribution-ShareAlike 4.0 International License. I am reflecting with your post, “Heroes In Our Lives,” because when I was little or a boy I had never watched any superhero show. If superhero shows could boost confidence and self-esteem then I could have used that in school to stay strong against bullies. One sentence you wrote that stands out for me is: “In our day and age, we live though tough times- whether it be a public problem, or a problem that delves down to the personal level” I think this is true because today’s society is crumbling, Trump is changing the government in so many ways. Firing people but yet he does good things, still self confidence in our presidential decision is fading. Superheroes can boost our thoughts and dreams and make through this hard time. Another sentence that I reflected upon was: “ images of the better people we strive to be”. This stood out for me because superheroes are the mutants of humanity, while normal people strive they fight crime and keep the citizens safe. The position of fame is what all humans strive for and having a good reputation is a dream come true. Superheroes never lie and always do the right thing even if the villain gets away. I do agree with you that superheroes are a true role model in today’s society. One reason I say this is Superheroes are unrealistic but inspire the kids, they show influence and boost imagination. Another reason I agree with you is how not only kids can watch superheroes. Thanks for your writing. I look forward to seeing what you write next, because this topic of what can improve a child’s life is very interesting. Also you have counted one of the most important influences that affect our lives.